Hmm.. Idunn doesn’t have the special eyes like the rest… is she different? Not very familiar with her story. Or is that just a stylistic choice of yours? 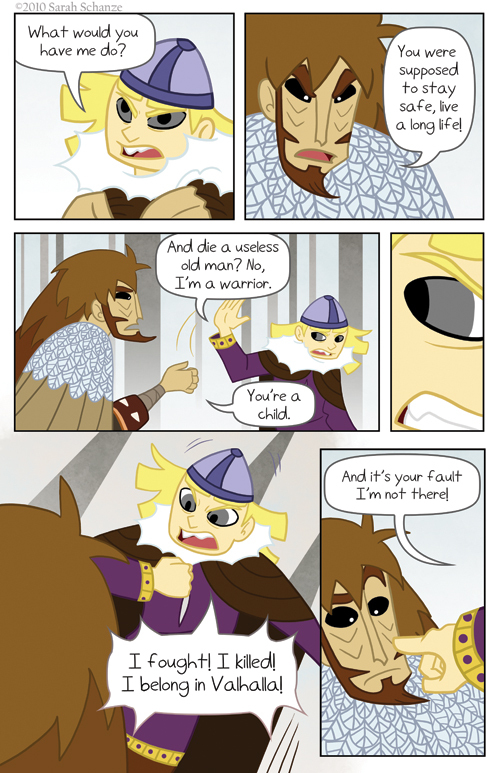 I actually drew this sort of outside of TMK’s storyline, so Idunn didn’t get the general gods’ eyes look just…because. XD I was mostly playing with opposites and design when I drew them, but I liked Hel’s design so much I decided to use it for the comic, though it might change a little bit. Thanks! Loki’s expression in the last panel is great. I doubt Loki is often the one surprised or confused. That’s kind of like the Spartans from ‘300’, where saying ‘May you live forever’ is the biggest insult they could throw at a person… if they didn’t totally kill you dead first! I bet more people would follow that old saying “An apple a day keeps the doctor away” if Idunn was the spokeswoman, or spokesgoddess. Wasn’t there a Grimm fairytale called ‘Mother Holle’ that was based on Hel? Haha! That Spartan thing is funny. Makes sense though! XD And Idunn would be the perfect spokesperson for that. Huh. Didn’t think that Loki openly opposed the whole ‘dying in battle’ thing. Interesting, is that one of the reasons he and the other gods don’t like each other so much, along with other things? Thanks! I like his design too, though drawing those darn feathers on his cloak can drive me nuts. Oh wow really? I haven’t read that anywhere, but I haven’t gotten to reading the Eddas yet (they’re on my list though). I do remember reading about Freyja getting half of the slain in battle and the other half went to Odin, and someone suggested she was more “defensive” and Odin was more “offensive.” It becomes hard to know which was really believed and who believed it with so many contradicting stories. I mean, Balder and his wife were surely honorable people, but they ended up in Hel. Unless they went there because they were gods…Haha! It gets pretty complicated! At the very least, in TMK Land, those who die from sickness or old age end up in Hel, honorable or not. Have to go with one thing over the other, and this has a lot of story potential. ;D Thanks for the info! I love to learn more about Norse mythology and vikings and all that good stuff. Oh, no, I love learning more about stuff, if only so I can go look more into something and figure it out myself. I’m glad you commented! I hope you’re enjoying the comic so far too. XD Thanks! And some supposed reasons for why Baldur went to Hel are that he was tricked and the fact that though he was killed by a weapon, he did not die in an actual battle. No, sorry to say, Idunn won’t be showing up, or not as a featured god. There are just too many gods, and I don’t want to clutter the cast with a dozen different characters. Sorry! I also really like the mythic aspect, and while I appreciate it being accessible to people like me who don’t know tons about the mythology, I also really like the usage of what you have learned, and I find the notes you make on the word meanings and mythology very interesting to read! I’m glad you like my notes! I love learning about things, so I love to pass on that knowledge to other people too. Sometimes readers will comment with more information on what they know and I’ll learn even more. The vikings get a certain reputation around the world because of how the media’s portrayed them, which is normally full of fantasy and little history (like horns on their helmets). TMK isn’t the work of a scholar, and I do use creative license now and then, but I hope to keep it fairly historically accurate.